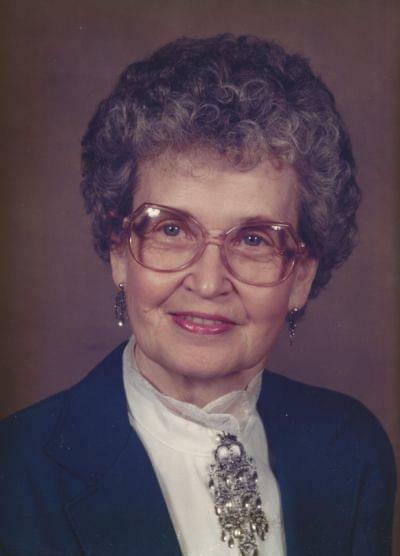 Myrtle T. Lokken passed away in Apache Junction, Arizona where she has lived for the last 30 years. She was 93. Myrtle was born on a farmstead south of Hazen, North Dakota and lived there until her family moved to a ranch in the Badlands near Killdeer, North Dakota. She and her brother Louis rode horseback to school until she was fourteen. Her sister Alma helped her move to Spokane, Washington where she attended and graduated from the Lewis and Clark High School. While working in Seattle, Washington she met and married Milo Lokken of Stanley, North Dakota. For their honeymoon, they drove a Model T cross-country from Seattle to Stanley, North Dakota over cattle trails and dirt roads. Myrtle often had to get out and push up steep inclines. Milo entered the Army during WWII. They were assigned to Camp Gordon Johnston in the Florida Panhandle and Myrtle worked for the Army in personnel assignments selecting those to depart for Europe. She was called “The Little Colonel” for refusing to be intimidated by rank and in fact, had the honorific on her desk plate. When Milo was discharged, they returned to Stanley, North Dakota where they built their first house around the birth of their first daughter. Four more children soon followed. Myrtle became active in the PTA and served as president for several years. Myrtle retired from the Mountrail County Welfare Office after more than 20 years as medical secretary. Milo retired shortly thereafter and they spent many years travelling between North Dakota and Arizona as “Snow Birds”. After Milo’s death in 1988, Myrtle continued to drive back and forth for several years until settling permanently in Arizona. Her last few months she was in the care of Companion Hospice in a Better Senior Carehome where she was lovingly attended. Myrtle is survived by her daughters Myree (David) Flanagan, Tucson, Arizona and Marianne (Craig) Hawk, Apache Junction, Arizona; her son Myron (Kathy) Lokken, Fargo, North Dakota; her son-in-law Leroy Gunderson, Stanley, North Dakota; Grandchildren Malinda Gunderson, Stanley, North Dakota, Melvin (Paige) Gunderson, Stanley, North Dakota; great grantchild Heather (Nick) Vestre, Bottineau, North Dakota; a great-great grandson Donovan Vestre; and one brother Joe Tysver, Scranton, North Dakota. Myrtle was preceded in death by husband Milo and daughters Mona and Marlene, several brothers and a sister. Daughter, Mona, developed AM Leukemia at sixteen years of age and died in Denver Children’s Hospital in 1972. Daughter Marlene was diagnosed with cancer and died in Tioga Medical Center in 2015. She was 68. Myrtle was a peacemaker, a gracious and generous woman well loved and respected by all who knew her. Memorial contributions may be made to the Luekemia and Lymphoma Foundation or to the Wounded Warriors. A Memorial Service for Myrtle will be held on Wednesday, January 20, 2016 at 2:00 PM at A Wise Choice Desert View Chapel, 9702 East Apache Trail, Mesa, Arizona. So sorry to learn of Myrtle’s passing away. I was employed at the Mountrail County Social Services office in Stanley starting in 1971, so am not sure when Myrtle retired. But, did work with her for several years and enjoyed her friendship. She was a very kind, gracious lady. I sent her a message last year on Facebook and she did respond. To my regret now, I did not get back to her again. May you rest in peace, Myrtle and, until we meet again, much love to you.